This is one of my favorite recipes. It not only makes a gorgeous and light dessert, but also adds elegance and a pop of spicy sweetness to salads and savory dishes. If serving the pears whole as a dessert, there’s an unusual step I learned as a pastry chef to achieve a smooth brilliant surface. Click here to view the step-by-step photo gallery. Cut a wide piece of peel from both the lemon and orange, and then juice each. Add half the lemon juice to a bowl of cold water. In the pot over a medium flame combine wine, water, sugar, spices, peels, and remaining citrus juices. While the liquid heats, peel the pears, slice a small piece from the bottom of each (this helps them to stand upright on the plate) and remove seeds with a corer. Drop them in the bowl of cold lemon water. Secret tip: To achieve the smooth surface, “sand” each pear lightly with the green Scotch Brite scour pad. When the liquid comes to a boil, reduce the flame so that it is simmering and add the pears. Cover the pears with a plate so that they are completely submerged in the liquid. Simmer for 20 minutes. Turn the flame off and allow the pears to completely cool in the liquid for at least a few hours and up to a day or more (the longer they remain in the poaching liquid, the stronger the flavor and color). Refrigerate if you are leaving them in for more than a few hours. 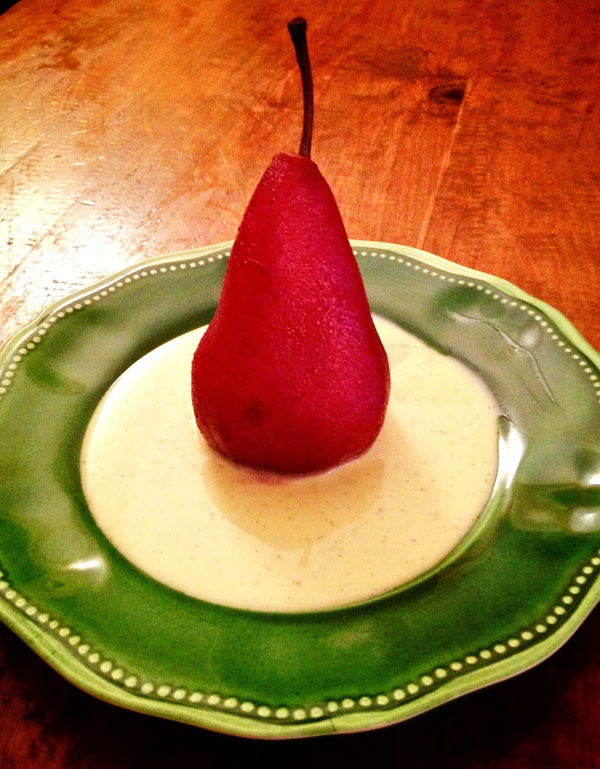 To serve: Remove pears from poaching liquid. Return the liquid to the stove and reduce over medium-high heat until it begins to get slightly syrupy. Serve pears standing in a pool of the syrup. Other serving suggestions: I love them best standing in a pool of cold vanilla bean crème anglaise (sauce). They are also wonderful with sweetened mascarpone or crème fraîche. Try slicing and serving them warm over gelato with toasted pistachios. For a salad: slice the pears, fan over greens tossed in vinaigrette. Add some toasted walnuts and a little Stilton cheese. The poaching liquid can be customized to suit your taste or the ingredients you have on hand. I often use a dry Riesling, honey (instead of sugar), a sprig of thyme, bay leaf, and vanilla, then serve the pears with a buttery almond shortbread. Gingerroot, cardamom seeds, and orange is a lovely combination, or try poaching the pears in a brandy-based liquid and serve with chocolate or caramel sauce. Whatever you decide to use, keep it simple and don’t overwhelm the fruit.